Yellfy Timeline is a social media service much like other social networks but much better. 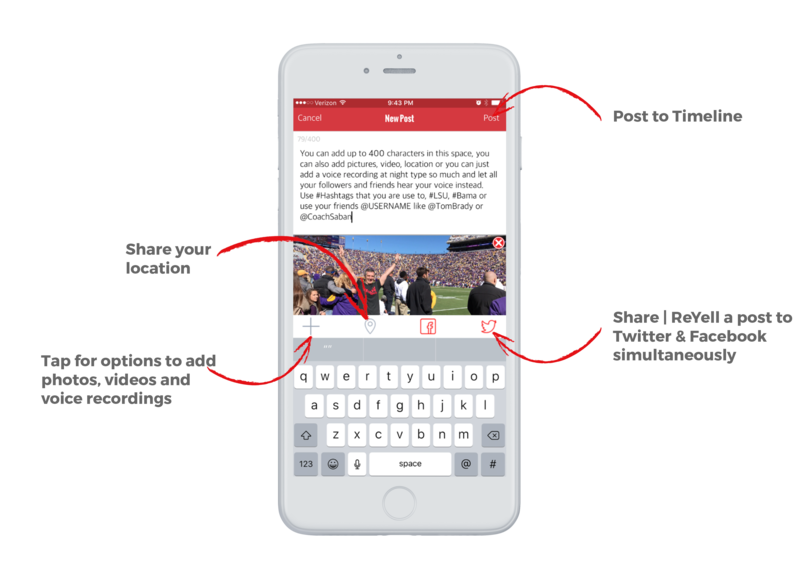 Yellfy’s timeline is a service for sports fans to communicate with each other and stay connected through the exchange of their passion for sports. People’s posts may contain photos, videos, voice blogs(vlogs), locations or links and up to 400 characters of text. These messages are posted to your profile, sent to your followers and are searchable on Yellfy Search. A post is any message posted to Yellfy’s timeline which may contain a voice recording, location, photos, videos or links and up to 400 characters of text. Click or tap the to post the update to your timeline. What does it mean to follow someone on Timeline? Following someone means you’ve chosen to subscribe to their updates. When you follow someone, every time they post, comment on a post or share a post of someone they follow, it will show on your timeline. Yellfy sends you an email and Push Notification when someone new follows you. Set up your email preferences to notify you when you have a new follower. The “Followers” link on your profile page or home page sidebar will also tell you who is following you. How can I filter my Timeline content? If you want you can “ Filter “ the Timeline content by tapping the Filter icon and choose between only seeing Posts from Fans you follow, news from writers you subscribed to or both categories of content. How do I post a picture, video, voice blog, text or share my location to Timeline? Uploading and sharing images, videos, text post, voice message or share location is easy! After tapping the post / Yell icon and the new window to write your post appears, tap the icon to see options for photos, videos or voice recordings. Tap the icon to share your location. Can I share all posts onto other social media sites? Yes, under each timeline post there is a icon. 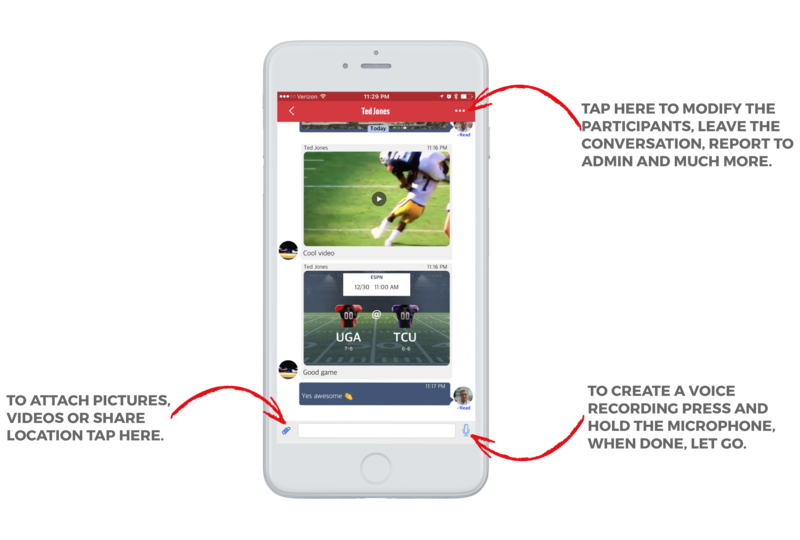 When tapped it brings up a menu where you can choose Twitter, Facebook, Pinterest and/or Tumblr to share any content from Yellfy onto your personal page at one or more of these social media platforms. If this is your first time sharing content, these apps will ask your permission to share Yellfy content. Yell is Yellfy’s Direct Messaging Feature. 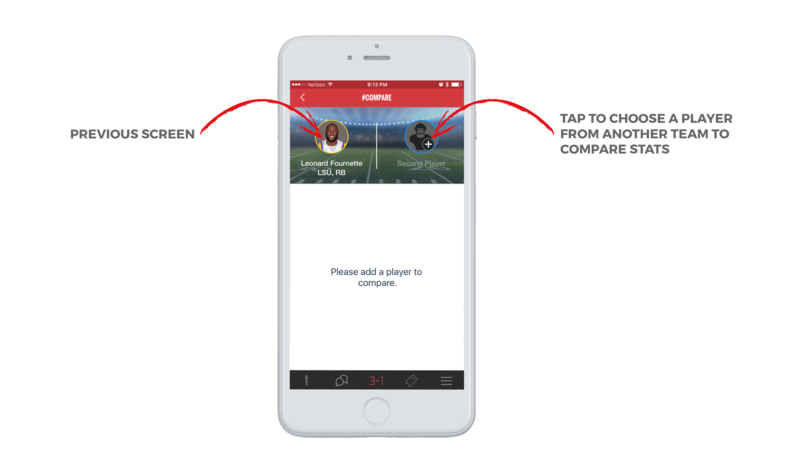 In Yell you can start a private conversation or create a group conversation with anyone who follows you. Anyone in a conversation can share and send Voice, Text, Pictures, Video, Locations, Scores to a Group or Individual 1-1 conversation. Everyone in a group can see all messages, even if everyone doesn’t follow each other. In group conversations, the Admin of the conversation can add other participants. Newly added participants won’t see the prior history of the conversation. In both Group and 1-1 conversations, you cannot be in a conversation with someone you block. How do I create a Yell? Tap on the Yell Feature Icon and you will be directed to the main screen, in which in this screen all your existing direct 1-1 and group messages are if you have already started them, if you do not have any prior conversations, then you can start a 1-1 or group conversation by tapping on the New Yell Icon . How can I create a Group Yell? 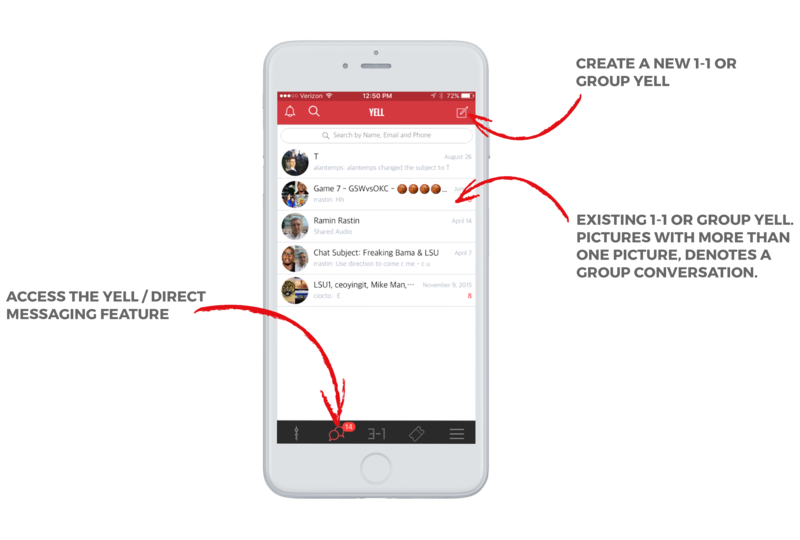 Tap on the Yell Feature Icon and you will be directed to the main screen, in which in this screen all your existing direct 1-1 and group conversations are, if you have already started them. You can start a group conversation by tapping on the New Yell Icon and choose the participants. How do I share a voice memo? After you create a new Yell conversation, press and hold the microphone, in which as long as you are pressing the it will record your voice and once released, it will share what you have recorded. How do I share a picture, video or my location? Tap on the paperclip and you will see each option appear. 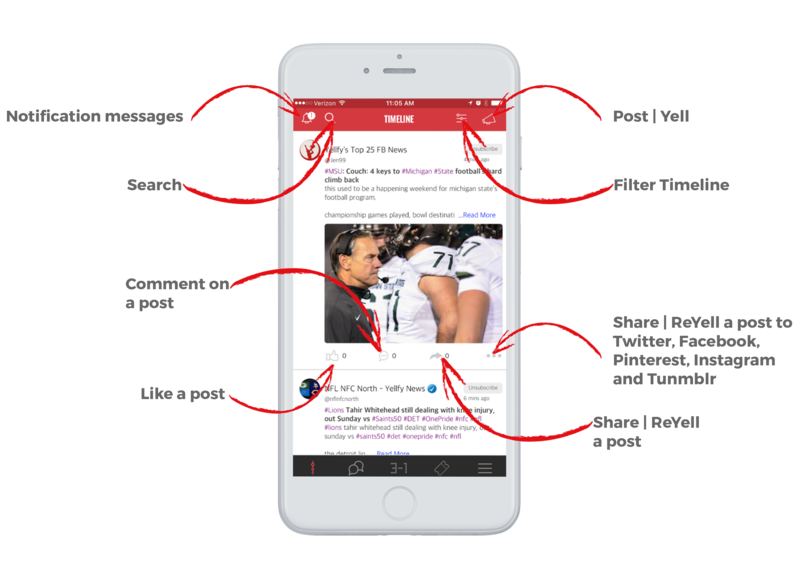 You can add multiple pictures or videos at once and at the same time, you can write a text cation on each media before you share. 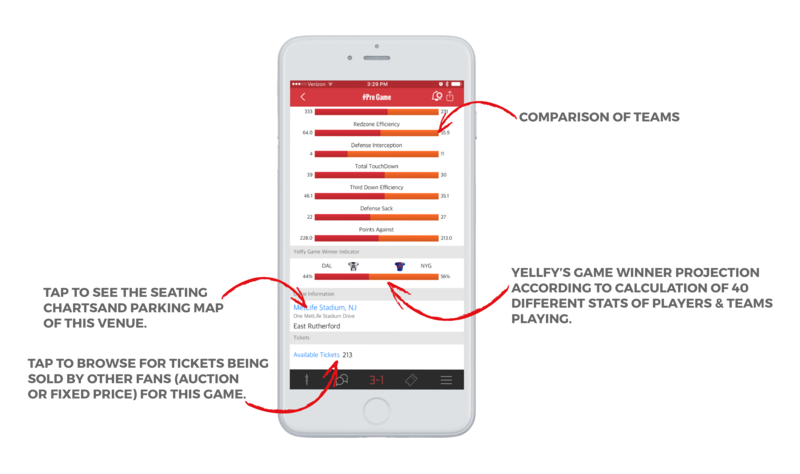 Yellfy’s Scores Feature provides Real-Time Scores, Player & Team Stats, Odds & Over Under, Game Winner Indication (some games), News, Rumors, League Blogs, Beat Writer Articles, Game Notifications… etc. How do I find and make a team my favorite? In the Favorite tab of the Scores Feature, tap on the Star icon (top right) and it will open up a dialog box. Here you can search or choose your team by going through the leagues and conferences. You can also access the same functionality in More (Three Lines Icon – Bottom Right) section of the App. What are the row of team logos at the top of most Scores pages? 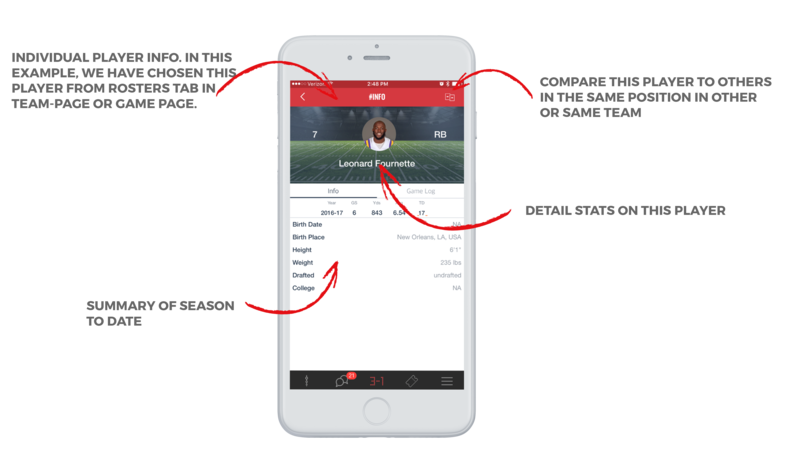 The teams belonging to each section, league or conference will show at the top in a scrollable fashion. 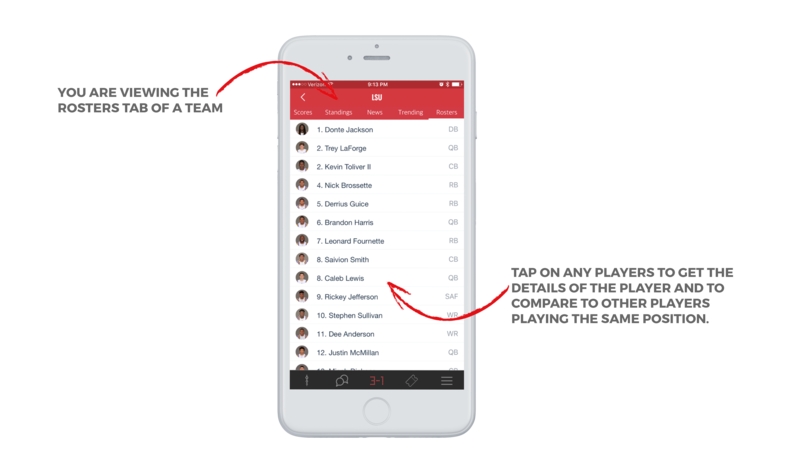 They are there if you wish to go directly to any team’s specific Team Page by simply tapping on the team icon . 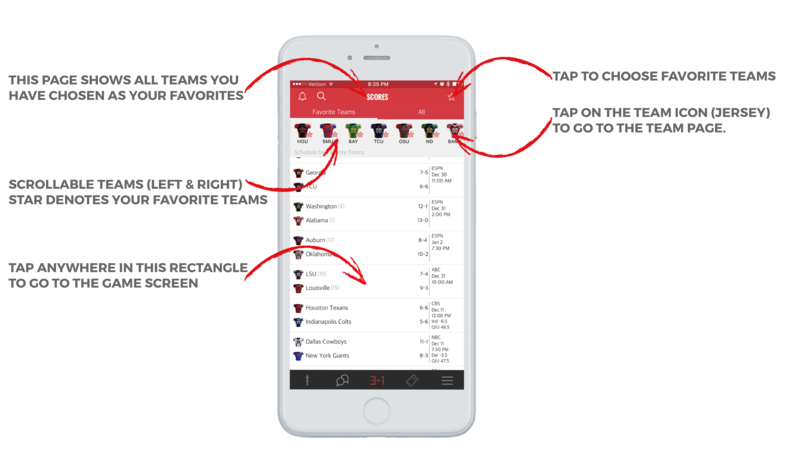 For example, in the Favorites tab, all your favorite’s icons are present on the top, or in NFL, all team’s logos are present at the top. How do I access individual team pages? 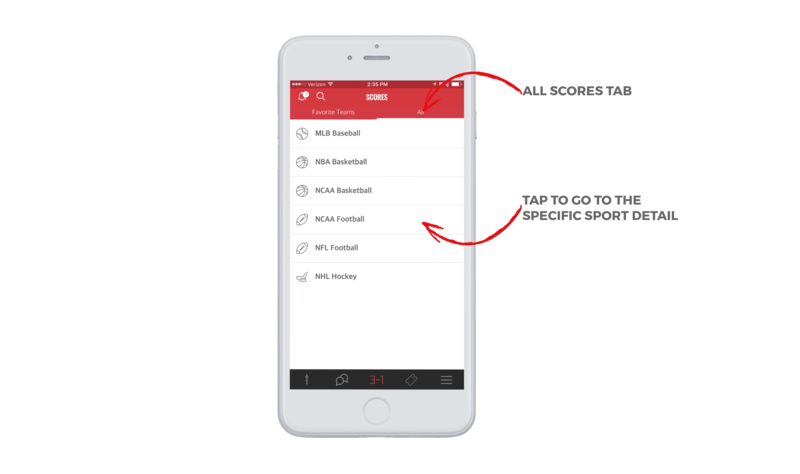 There are several ways, one way is to tap the team logo which is located on the top horizontal row of whatever league or conference you are in. You can also access any of the 2 teams in a game from tapping on their logo in the game page. What is the “Tickets Available“ line in a Pre-Game screen? Other fans like you are selling their tickets, auction or fixed price. When you tap on the “ Tickets Available“ line, you will be taken to the screen where the all tickets being sold. Can I see stadium seating charts and parking lot maps for the game I am going to? Yes, in each Pre-Game status the venue/stadium name is shown, when tapped on, you can browse the seating charts and parking maps for the stadium.